[prMac.com] Perg, Austria - Typinator has been a leader in the field of text expansion software for nearly a decade. With the recent release of Typinator 6.0, which added more than 50 powerful new features and improvements, Ergonis underlined this leading role impressively. The unique support for regular expressions, top marks for speed, robustness, and ease of use, make Typinator the clear number one in its field. The biggest innovation in Typinator 6 is doubtlessly the possibility to create expansions based on regular expressions. This is an extremely powerful feature that opens the door to revolutionary uses that were previously impossible with Typinator (as well as any other text expansion utility). Typinator also uses this technical foundation to implement features like DOuble CApitals correction, auto-capitalize sentences, and more. For further flexibility, Typinator 6.1 introduces a new marker for suppressing the current replacement, which can be used for defining exceptions of other rules. A new predefined set for exceptions of the auto-capitalize sentences rule makes good use of this new marker. The new version also adds a new marker for temporarily pausing Typinator. Besides that, Typinator 6.1 adds a new function for sorting text lines and a new option to insert a delay in the middle of an expansion. Visit Ergonis Software's website to learn more about the 20 improvements in this release and to download and try the new version. Other text expansion tools may offer many individual features, but Typinator is miles ahead in effective functionality, all this based on elegance, simplicity and clarity. Instead of confusing users with a lot of patchy simple features and preference settings, Typinator offers a reasonable number of clean concepts that form the foundation for "customizable features." As a consequence, sophisticated features do not bloat the user interface but can be added by means of predefined sets. And the features can be combined with each other in arbitrary ways, which opens the door to revolutionary use cases without complicating the user interface. For example, regular expressions can be combined with Typinator's built-in calculator to perform inline calculations of formulas as you type. Typinator 6.1 requires Mac OS X 10.5.8 or newer and is compatible with OS X Mavericks. (The usage of regular expressions requires Mac OS X 10.7 or newer.) Typinator 6.1 is a recommended upgrade for all users running on OS X Mavericks. Typinator can be purchased securely on the Ergonis Software website. 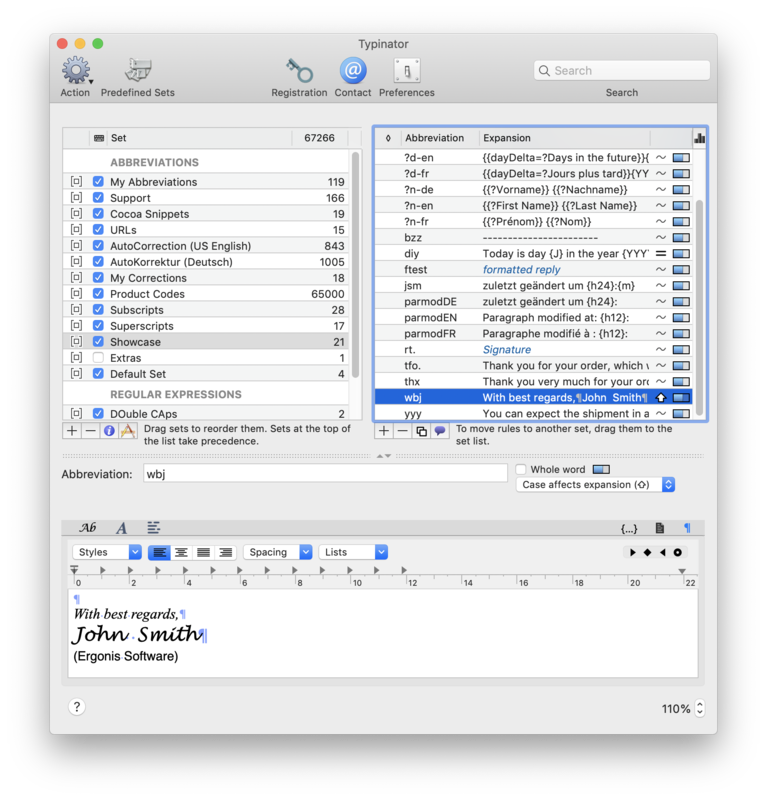 The upgrade to Typinator 6.1 is free for anyone who owns a license for Typinator 6 or purchased a license for Typinator 5 on or after October 1st 2013. Upgrade paths are available for customers who purchased their license before October 1st 2013. All customers who purchase an upgrade or a new license for Typinator 6, will get all subsequent 6.x updates for free. For information about purchases, including enterprise licenses, volume discounts, and upgrade pricing offers, see the company's web site.